We made a portable solar charging tracker « Adafruit Industries – Makers, hackers, artists, designers and engineers! This is actually not any sort of product or public project (!) 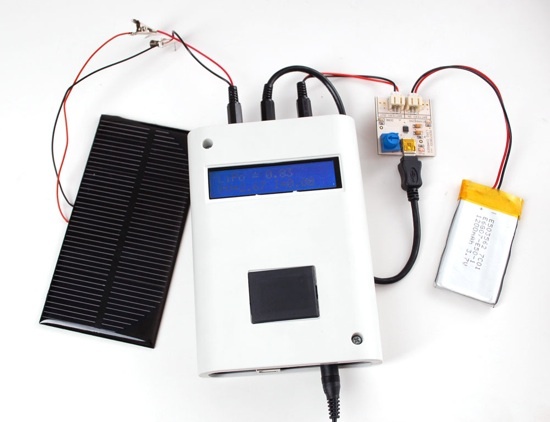 – its something we designed to help me evaluate solar panels and how they act when charging batteries. Normally this requires a lot of multimeters and its a bit of a pain to do if you have to constantly change out panels. So we decided we would build a specialized tool that would assist us. Here is what we wanted! We figured if we had to build this, someone might find my notes useful. However, this documentation is primarily intended to demonstrate how to use the enclosure we carry in the adafruit shop. This design is intended for ~6V panels, single Lithium Polymer cells and chargers. It can very easily be adapted to any kind of panel and charger, you’ll just need to adjust the resistor dividers and such! Wow- that’s really cool. Thanks so much for sharing! The Arduino project case is really slick. This is great! I’ll likely build something similar very soon. Is there somewhere that we can get more info on the analog boost circuitry you are using on the solderless board in the video? I’m a little confused at how you are doubling your current. It doesn’t seem that’s mentioned on the quickie site, but I may have missed it. Will the max power point tracker be released as a standalone project, or as part of the charger? Here’s another request for more info! A lot of the stuff that I found on the topic was pretty mysterious…enough that I gave up pretty quickly, at least.